Two questions: “What is your assessment of the current worldwide state of socio-economic-political conditions?” and “How hopeful are you that humanity—and the planet—will survive the accumulating impact of 7.5 billion consumers (and growing at an annual rate of 80,000 new citizens, births minus deaths)?” I think you’ll agree that the scope of all converging crises presents us with the single greatest challenge humanity has ever faced. In a recent meeting of five kindred sustainability colleagues, these concerns were addressed. We candidly expressed our personal thoughts and feelings about the state of current world conditions, and the ominous trajectory we’re on. Because each of our group is committed to seeking operative solutions, we first focused on ways and means of encouraging more citizens to pursue responsible, constructive action. We concluded that widespread sustainability-oriented education should be a major priority, as a foundation for creating citizens dedicated to attaining sustainability goals. We also acknowledged the applicability of the commonly acknowledged stages of grief—denial, anger, bargaining, depression, and acceptance—in addressing such grave concerns. There’s no question that many people are experiencing various stages of grief, an unavoidable reality when considering the constant media bombardment of negative news and views, expressions and behaviors. The five of us appear to be far beyond the denial stage when it comes to grasping the enormity of the challenges we’re facing, which includes: depletion of resources; extinction of flora and fauna species; pollution of air, water, and soil; human-induced climate change; and a rapidly growing world population, the upstream catalyst. Moreover, bargaining is no major concern to us, unless we think of it as finding ways to compromise with political opponents. On the other hand, everyone periodically experiences various degrees of anger, depression, and acceptance. Episodes of depression are typically momentary, as when learning our elected president turned out to be someone we consider eminently unqualified for such a critical national-international leadership role. Even worse, he holds views that counter any constructive approaches to creating a sustainable planet. So while we are not pleased with the overall way things are going, we are able to accept the unpleasant and variable aspects of all we’re experiencing. In sum, since humankind’s modern-era consumption binge is irreversible, the only feasible approaches in dealing with the growing crises appear to be mitigation and adaptation. Mitigation, which primarily relies on using a combination of low-and-high-tech solutions, has one major drawback: It lures us into placing unwarranted confidence in technological “magic bullets”. Yet, there’s little question that we’ll need to pursue any practical technological solutions, especially advances in renewable energy sources, which are proving extremely effective in reducing and replacing fossil-fuel energy sources. Adaptation is also a viable strategy deserving serious attention. Acknowledging experts’ predictions about the future realities of climate change, many savvy citizens are practicing ways to achieve greater resilience and sustainability. At the forefront are Transition folk, hardy souls at the front line of developing skills at adapting. Not surprisingly, the numbers of individuals and groups committing to transition practices are growing. You can learn about the transition movement by consulting the Transition US website (http://www.transitionus.org/). There you will find information about the movement, including details about the first National Transition Gathering, which will be held in St. Paul, MN at Macalester College July 28-29. Also of note, Leslie McKenzie, a Twin Cities transition leader, in conjunction with two colleagues, will give a presentation—“Helping Our Community Transition to a Sustainable Future”—for a Sustainability Forum at the St. Anthony Village City Hall (Council Chambers) on Saturday, July 8, 3-4:30 p.m. This event is free and open to the public. In conclusion, rather than denying or fleeing from approaching dangers, let us choose to courageously stand and fight. As Emily Johnson expresses passionately in a timely article, Fighting For Our Lives: “My life, and your life, and all the life around us—they’re worth fighting for.” An all-out WWII style mobilization is needed to ameliorate and, hopefully, stabilize harmful worldwide conditions, especially any action that exacerbates climate change. As we increasingly confront a future filled with converging crises, we are called upon to urgently undertake strategies aimed at mitigation and adaptation. > Cultural Anthropology: The Banality Of The Anthropocene (Heather Anne Swanson). Although several U.S. agricultural states have ruined landscapes [due to corporate-style farming], Iowa is objectively one of the worst. Less than 0.1% of the tall-grass prairie remains, and 99% of its marshes are gone. In public land holdings, Iowa ranks 49th out of the 50 U.S. states. Its main aquifer has dropped by as much as three hundred feet since the 19th century, largely due to the extraction of irrigation water. Between 2010 and 2015 more than 60 Iowa municipalities had high nitrate levels in drinking water due to the leaching and run-off of agricultural fertilizers that wash down the Mississippi River to the Gulf of Mexico, creating an aquatic dead zone the size of Connecticut. White middle-class American subjectivities are predicated on a refusal to acknowledge the histories we inherit. Can we imagine ways in which people might be drawn into new ways of seeing themselves and their worlds? > Medium: A Design School For Planetary Collapse (Joe Brewer). Design schools are failing their students in a time of unprecedented disruption and ecological collapse. We need a Design School for Planetary Collapse that addresses such questions as: 1) What is the Earth System and how does it work? 2) What does it mean to be human and why is this important? 3) How does one study change in all its forms? 4) What kinds of competency will be needed to do the work? 5) Who else is doing this that is also on this learning journey? At the core, such a school would inculcate a combination of intellectual, emotional, and moral maturity that our present “leaders” clearly lack, including a selfless commitment to preserve sacred things and the moral fortitude to do what is right, even if it means taking a painful or scary path. The world needs spiritual leaders with design skills in what is sure to be a time of great turbulence and hardship for billions of people. > Truthdig: The Death Of The Republic (Chris Hedges). The deep state’s decision in ancient Rome—dominated by a bloated military and a corrupt oligarchy, much like the United States of 2017—to strangle the vain and idiotic [narcissistic] Emperor Commodus in his bath in the year 192 did not halt the growing chaos and precipitous decline of the Roman Empire. Societies that once were open and had democratic traditions are easy prey for the enemies of democracy. Demagogues pay deference to the patriotic ideals, rituals, practices and forms of the old democratic political system while dismantling it. Our constitutional rights—due process, habeas corpus, privacy, a fair trial, freedom from exploitation, fair elections and dissent—have been taken from us by judicial fiat. The relationship between the state and the citizen who is watched constantly is one of master and slave. And the shackles will not be removed if Trump disappears. > Cassandra’s Legacy: Why The American Way Of Life Is Negotiable: The Coming Transport Revolution (Ugo Bardi). In a previous post, Bardi discussed the RethinkX report by James Arbib and Tony Seba on the future of transportation. The report discusses a technological revolution that would bring about a new concept: “Transportation as a Service” (TaaS) that will people to move mainly by using publicly available, driverless cars. The explosive historical development of private motorization happened because it could happen, but the number of cars per person and per household is trending down, as is the number of miles driven per person or per car. One factor is the rising expense of cars, mainly because cars are becoming heavier and more complicated. Gradually, a higher fraction of the population will no longer afford cars, a time when owning a car will become a special burden, especially for suburban populations. It’s likely that, eventually, people won’t own cars anymore; they’ll rent them. > Open Democracy: Neoliberal Psychology (Joe Millward-Hopkins). Neoliberalism is typically used to describe such processes as privatization, deregulation, the cutting back of social and welfare provision, the retraction of the state, and the idealization of free-markets. Neoliberal rationalities are both political and psychological. The world is no longer perceived simply as property to be consumed, but as an opportunity to be captured in order to increase returns to financial, social or human capital—a trickle down of capitalist rationality (without a trickle down of wealth). It appears that our lives have become almost permanently projected into a place lying somewhere between the present and the future. It’s no wonder that we now hear talk of so many psychological disorders. A growing recognition of the need to counter these trends is evidenced by the surge of interest in mindfulness and meditation, but the response of capitalism has been to appropriate these practices and direct them towards productivity and profits. > Resilience: What Is A Liberal? (Erik Lindberg). Liberalism might be dated to the Enlightenment philosophy from which the political experiments of the American and French revolutions received their inspiration. Liberalism should not be confused with the left or “progressive” side of the prevailing spectrum, but encompasses the full range of today’s predominant political choices, I use the label “Liberal” when referring both to political liberals (the U.S. Democratic Party) and so-called political conservatives (the Republican Party). John Stewart Mill defined a Liberal as a person who believes that people are and should be free to do whatever they like up to the point at which it keeps others from doing as they like. This pursuit of self-interest with limited constraints was articulated by Adam Smith, and is enshrined in the American Constitution, which mainly addresses the many details of trying to put this principle into a governable order. If there is a great crime in Liberal thought, it is prohibiting people from “doing as they like” when it doesn’t hurt anyone else in pragmatic or material ways. > Peak Prosperity: The Federal Reserve Is Destroying America (Chris Martenson). One of the chief failings of central banks is due to the notion that humans are free to pursue perpetual exponential economic growth on a finite planet. This explains why central banks are actually in the business of promoting perpetual exponential growth of debt. But since growth in credit drives growth in consumption, the two concepts are indistinguishable from each other. In sum, central banks are in the business of sustaining the unsustainable, and real consequences are coming. A summary of an accompanying 10-minute video is this: the Fed is now paying interest on so-called ‘excess reserves’ held at the Fed, including a huge chunk of money held there by foreign banks that are only too happy to receive 1% on their holdings from the Fed given that their own central banks are paying 0%, or even negative rates. It’s this simple: US foreign banks are being paid billions of US taxpayer dollars and they are getting richer at the expense of citizens. > Resource Insights: Stock Hedges, Home Insurance, And Our Misunderstanding Of Risk (Kurt Cobb). “Tail risks” refer to the possibility of unusual, rare, catastrophic events, often of a nature that cannot be anticipated or even imagined. Such events are frequently dubbed black swans, a term made famous by Nassim Nicholas Taleb’s book called The Black Swan. So, what is the perceived difference between houses and stocks and what does that tell us about how we judge risks elsewhere in our lives and societies? There is no insurance policy that will protect us against catastrophic climate change. We cannot get our habitable climate back on any time scale that matters to humans once it’s gone. The insurance policy is us, that is, changes in our behavior and our technology done quickly enough to matter. There is no other hedge that will help us. > Gizmodo: Collapse Of Enormous Antarctic Ice Shelf Imminent (George Dvorsky). In a dramatic development, the giant rift in the Larsen C ice shelf has grown an additional 17km since last week, and the leading tip of the crack is now exceptionally close to the ocean. There’s now very little to prevent a complete collapse—an event that will produce one of the largest icebergs in recorded history. As documented by scientists at Project MIDAS, a mere 13km now separates the leading tip of the 142km-long crack and the ice front. When it calves, the Larsen C Ice Shelf will lose more than 10 per cent of its total surface area, and be among the largest icebergs ever recorded. > Washington Post: Scientists Just Published An Entire Study Refuting Scott Pruitt On Climate Change (Chris Mooney). In a sign of growing tensions between scientists and the Trump administration, researchers published a scientific paper Wednesday that was conceived and written as an explicit refutation to an assertion by Environmental Protection Agency Administrator Scott Pruitt about climate change. The study, in the journal Nature Scientific Reports, sets up a direct test of a claim by Pruitt, made in written Senate comments following his confirmation hearing, that “over the past two decades satellite data indicates there has been a leveling off of warming.” After reviewing temperature trends contained in three satellite data sets going back to 1979, the paper concludes that the data sets show a global warming trend—and that Pruitt was incorrect. > Carbon Brief: Half The Global Population Could Face Unknown Climates By Mid-Century (Robert McSweeney). Billions of people across the world could see climates they’ve never experienced before by the middle of the century, a new Nature Climate Change study says. Using a measure of climate ‘familiarity,” the researchers show that the tropics in particular are likely to experience conditions that are virtually unheard of for the region in the present climate. By the 2030s, around half of the global population can expect to experience “unfamiliar” climates (compared to 1986-2005), and “unknown” climates by mid-century. But keeping global temperatures rise below 2C above pre-industrial levels could help keep the climate “familiar” within this century, the researchers say. 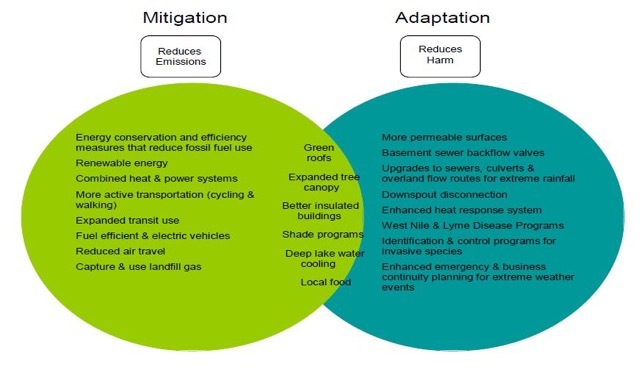 That means people alive today could see the benefits of mitigation within their lifetimes [IF preventive measures are taken soon and effectively]. 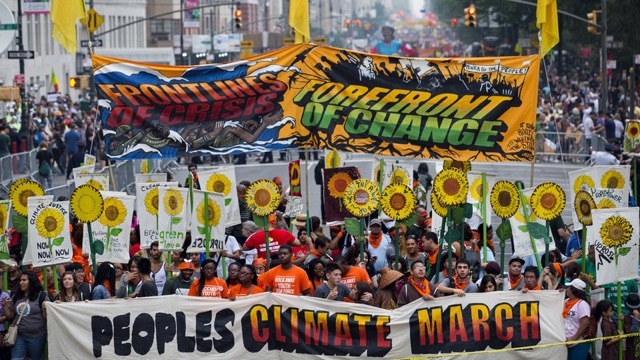 > Common Dreams: 8 In 10 People Worldwide Fear ‘Catastrophic’ Climate Change: Poll (Nadia Prupis). A majority of people in eight countries say they are ready to change their lifestyles if it would prevent climate catastrophe, a survey on global threats released Wednesday found. The poll of 8,000 people in eight countries—the U.S., China, India, Britain, Australia, Brazil, South Africa, and Germany—found that 84 percent of people now see climate change a “global catastrophic risk.” Many people now see climate change as a bigger threat than other issues like population growth, weapons of mass destruction, and artificial intelligence, among other concerns, the poll found. Still, those fears also ranked high, and the survey found that about 70 percent of respondents would support a new global organization designed to address international risks. > Ensia: On The Thawing Tundra, Researchers Race To Understand Black Carbon’s Climate Impact (Madeline Ostrander). Scientists have been tracking sources of black carbon, a type of air pollution that contributes to climate change, in remote places like a laboratory in Utqiaġvik, Alaska. There, scientists and graduate students used state-of-the-art equipment to collect samples of Arctic air particles. Black carbon is a product of incomplete combustion from forest fires and the burning of both wood and fossil fuels, and its influence on the Arctic is like the proverbial death by a thousand cuts. At the top of the world, black carbon can land on snow and ice, darkening them, causing them to soak up more heat from the sun and melt faster. It can also absorb and radiate heat from sunlight as it floats through the atmosphere. Black carbon may be worsening the extreme warming felt all over the Arctic, record temperatures that are making permafrost disintegrate and sea ice melt. In sum, the Arctic is rapidly unraveling. > Pioneer Press: Best Park Systems In The Nation? Ranking Says Minneapolis, St. Paul (Nick Woltman). The Twin Cities are once again atop the Trust for Public Land’s annual ranking of the best park systems in the United States. For the second year in a row, Minneapolis and St. Paul ranked first and second, respectively, on the 2017 ParkScore Index, according to a news release issued by the Trust for Public Land. The index ranks the 100 most-populous U.S. cities based on three criteria: access to parks, parkland acreage, and park facilities and investment. St. Paul scored 82.5 out of a possible 100, while Minneapolis scored 86.5. The two cities received identical scores in the access and the facilities and investment categories, but Minneapolis won out because it has more total parkland than St. Paul. You can view a comparison of their scores here. > Science Magazine: Where Have All The Insects Gone? (Gretchen Vogel). Entomologists refer to the windshield phenomenon in explaining why today’s drivers spend less time scraping and scrubbing insect remains off their windshields. Scientists have tracked alarming declines in domesticated honeybees, monarch butterflies, and lightning bugs. But few have paid attention to the moths, hover flies, beetles, and countless other insects. A new set of long-term data is coming to light from a dedicated group of mostly amateur entomologists who have tracked insect abundance at more than 100 nature reserves in western Europe since the 1980s. Over that time the Krefeld Entomological Society has seen the yearly insect catches fluctuate, as expected. But in 2013 they spotted something alarming when they returned to one of their earliest trapping sites from 1989: the total mass of their catch had fallen by nearly 80%. Such losses reverberate up the food chain. Causes may be attributed to changes in land use surrounding the reserves, and neonicotinoid pesticides, another prime suspect. > New Economics Foundation: Building A New Social Commons (Anna Coote). The NEF works to build a new economy where people can really take control. To move towards that goal, we have to think about two things: 1) the process of gaining control, and 2) the resources over which people take control. As part of this work, we draw inspiration from growing movements to claim and control ‘the commons’. This refers to resources that are life’s necessities, including: 1) Natural resources—land, water, air, and sources of energy; 2) Cultural resources—knowledge; 3) Economic resources—funds for investment in the public interest; and 4) Social resources—relationships and activities through which we help each other participate and flourish. This paper focuses on social resources. We must build the case for a new social commons, and urgently, because we’re in danger of losing what we’ve taken for granted for half a century. The old order of politics, including the post-war welfare settlement, is crumbling. > Tikkun: A House On Shaky Ground: Eight Structural Flaws Of The Western Worldview (Jeremy Lent). In researching my book, The Patterning Instinct: A Cultural History of Humanity’s Search for Meaning, I excavated the hidden layers of our modern worldview and found that many of the ideas or myths we hold sacrosanct are based on flawed foundations. Here are the 8 structural flaws, balanced with their positive counterparts: 1) Humans are fundamentally selfish: Humans are fundamentally cooperative; 2) Genes are fundamentally selfish: Nature is a Network; 3) Humans are separate from nature: Humans are a part of nature; 4) Nature is a machine: Nature is a self-generating fractal; 5) GDP is a good measure of prosperity: A country’s genuine progress is a better measure; 6) The earth can support limitless growth: Grow quality, not consumption; 7) Technology has the solution: Systemic change is needed, not techno-fix; and 8) The universe is essentially meaningless: The universe is a web of meaning. Once we become aware of the structural flaws in the dominant culture, they can’t be ignored. We begin to see their manifestations all around us. > Citizens Climate Lobby: Climate Solutions Caucus Making Its Mark In 115th Congress (Kelsey Bullis). The House Climate Solutions Caucus and their staffs have been working diligently to generate bipartisan initiatives and legislative pursuits to fight climate change. Plans are coming to fruition, with caucus stamps on two bills introduced in the House of Representatives: 1) The Climate Solutions Commission Act of 2017, which establishes a bipartisan National Climate Solutions Commission responsible for reviewing economically viable public and private actions to reduce greenhouse gas emissions; and 2) H.R. 1090, also known as Technologies for Energy Security Act, which extends the residential energy efficient property tax credit through 2021 (credits for expenditures directed towards geothermal heat pump, fuel cell, and small wind energy properties). In addition, in April four Republican caucus members joined their colleagues in a letter addressed to President Trump urging him to maintain the US’s commitment in the Paris agreement. > Resilience: The Case For Phasing Out Alberta’s Tar Sands (Gordon Laxer). The Alberta, Canada oil-tar sands have always been a high-cost, dirty, marginal source of oil. Prospects for their success depend on: 1) a falling world supply of conventional oil; 2) a growing global demand for oil; 3) little serious international action to limit greenhouse gases; and 4) most of all a high world oil price, which is below break-even pricing. My report proposes three steps to end Sands production by 2040:1) Place a permanent moratorium on new Sands production; 2) Give a closing time for Sands projects and units of projects that long ago paid off the capital costs; and 3) Require each Sands project to lower its emissions annually by 3–4% per year, or 2–3 Megatons (Mt), starting in 2018. Projects that fail to meet greenhouse gases (GHG) reduction targets must be fined at a level higher than the costs to comply. > WTS Best Practices: The Ocean Cleanup (Matt Hoiland). In addition to plastic’s many advantages, it also has some serious downsides. Americans use more than 50 billion plastic water bottles annually, but recycle only about 31%. Roughly 34.5 billion of those bottles end up in landfills, or discarded in streams and rivers that end up in oceans, creating huge subtropical gyres of plastic debris. A 17-year-old Dutchman named Boyan Slat founded The Ocean Cleanup, an ambitious project aiming to sustainably achieve a plastic-free ocean by 2050. Slat and the engineers have developed a system that uses ocean currents and wind to push plastics into a large containment boom made of a 1-2km long rigid high-density polyethelene pipe, which is designed to float on the surface and trap objects, from tiny particles to large items. Wave and solar energy will power onboard electronics. When the containment system is full, pumps and a conveyer system will transport the plastic to a support vessel that will transport it to shore for recycling. Reselling branded Ocean Cleanup plastic and making it into useful products should be self-sustaining. > Bloomberg: How We’ll Eat Fish in the Future (Deena Shanker). A 2016 report from the United Nations found that 31.4% percent of the world’s stocks were overfished and another 58.1% fully fished. Meanwhile, aquaculture surpassed wild-caught fish as a source of seafood for human consumption in 2014. Many see it as the next frontier in sustainable food production. “We’re eating more seafood globally, which is a good thing because it’s healthy, but we’re taking more than the ocean can naturally replenish,” said Amy Novogratz, managing partner of Aqua-Spark, a Netherlands-based investment fund focused on sustainable aquaculture businesses. “Aquaculture is known a little bit for its bad reputation, and some of it is deserved (like China’s use of antibiotics and fish feed made from wild-caught species), but it’s a young enough industry that you can go in and rebuild it a little, so as it grows, it grows more sustainably.” Proponents of land-based aquaculture systems say these can be a better option because there is no escape risk or waste discharged into the oceans. > Medium: How Green Is My Alley (Wayne Roberts). Public Produce: Cultivating Our Parks, Plazas and Streets for Healthier Cities, by Darrin Nordahl, is an unusually important book, if only because the topic is so unusual — how people in cities and towns can grow food on public lands. It’s quite amazing how much high-quality public land is readily available, accessible, and mostly of good quality. Even damaged and paved-over lands can readily support food production, simply by putting rich and clean soil in bins and raised beds. Urban farming becomes an opportunity — for employment, food production, and food waste management, which should result in a circular economy. Opening public lands up for food production eventually needs an agenda for the democratization of the public commons. > Low-Tech Magazine: Could We Run Modern Society On Human Power Alone? (Chris De Decker and Melle Smets). Compared with fossil fuels and renewable energy sources, human power has a lot of advantages. A human can generate at least as much power as a 1 m2 solar PV panel on a sunny day — and as much as 10 m2 of solar PV panels on a heavy overcast day. Human power is a dispatchable energy source, and just like fossil fuels, Its power output is not dependent on the season, the weather or the time of the day. In fact, humans can be considered renewable energy sources and batteries at the same time. Unlike fossil fuels, human power can be a clean energy source, which produces little or no air pollution and soil contamination. Furthermore, humans don’t need to be factory manufactured. Finally, human power is carbon neutral, and like fossil fuels an all-round power source. The design and construction of the prototype human power plant is documented on a separate blog: Human Power Plant. > Citizens for Sustainability: Monthly Meeting-Forum, Sat., June 10, 10-11:30 a.m., St. Anthony Village Community Center, 3301 Silver Lake Rd. > Climate Action Events: Northwest Metro Climate Action, May 25, June 7, 8, 21. Anoka Area Climate Action, June 8(Ocean Acidification). See websites for details. > Transition Twin Cities: Events: Northern Spark Transition Message—May, June; 1st National Gathering of Transition Towns US—July 27-31, Macalester College, St. Paul. For info: (http://transitiontwincities.org/).